Super Mario Earphones | OhGizmo! You can choose to drop a few hundred dollars on a set of multi-driver earphones and run the risk of forgetting them someplace. Or you can spend an order of magnitude less and express your undying admiration for iconic game franchises. 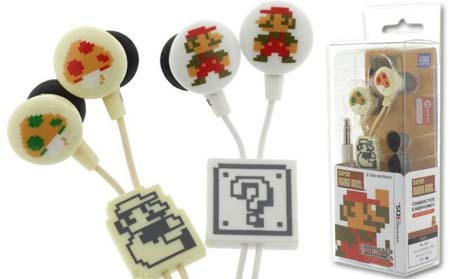 The Super Mario Earphones probably sound like crap, might break after a few uses and generally don’t scream “quality product”, but they do sport 8-bit images of your favourite plumber and related Mario paraphernalia. For $25, you won’t break the bank even as Mario goes about breaking blocks on your ears. And that, my friends, was the terrible joke of the day.